The Spiritual Director of the Adoration Ministry, Enugu, Rev. Fr. Ejike Mbaka, has lambasted his critics, insisting that God deserves money. Mbaka said this while responding to criticisms over a video that went viral wherein he was seen trying to compel the Vice-Presidential candidate of the Peoples Democratic Party, Peter Obi, during the annual harvest and bazaar celebration of the church to disclose how much he would donate to his church project. The cleric had told a reluctant Obi that God hates stinginess and if he continues to act in such a manner, he and the PDP Presidential candidate, Atiku Abubakar, would lose woefully come election day. In a new video which was posted on Youtube by Dave Partner and has been viewed over 11,000 times, Mbaka, who spoke in English and Igbo intermittently, said God deserves money and there was nothing wrong with him asking for donations. The cleric explained that bazaar day is strictly for raising of funds and that is the only time his church asks for donations. Mbaka said, “There are some people who are ingrates. These are people from the kingdom of succubus and Incubus. I want to tell you that all these things are caused by jealousy and envy. They are not fighting Mbaka for anything wrong. “Everyone who came was blessed but they turned it against me, saying I am after money. God deserves money. If you don’t want to bring your own in your stinginess, hold it. I will give God all that I have and even if anybody wants to join them, you’re free to join them. The cleric said all those fighting him were fighting God. He subsequently asked God to punish his detractors and those “firing arrows at him”. 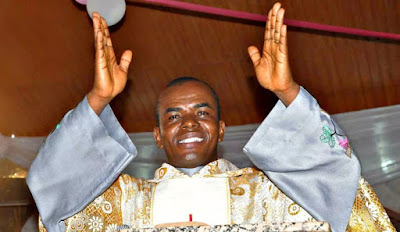 Although he did not mention Obi’s name, Mbaka said any politician who had donated money to his ministry was free to send his or her bank account number and he would gladly return the donation. On why he demanded money from Obi publicly, the cleric said he wanted the process of donation to be open and transparent so that no one would accuse him of diverting funds. Mbaka said every person who made a donation on the day the bazaar held did so publicly. The cleric added, “We do it outside, publicly because if I am silent, rumours will begin to spread that someone gave me $10m and why did Mbaka keep quiet? They will abuse me even if I am silent because anytime they want to attack this ministry, they will start somewhere. The cleric insisted that he was not partisan, adding that every person, regardless of political leaning, was free to come to him for blessings.